What are Dental Crowns and How Do They Work? A crown is a type of dental restoration which completely caps or encircles a tooth or dental implant. Crowns are often needed when a large cavity threatens the ongoing health of a tooth. They are typically bonded to the tooth using a dental cement. Crowns can be made from many materials, which are usually fabricated using indirect methods. Crowns are often used to improve the strength or appearance of teeth. While inarguably beneficial to dental health, the procedure and materials can be relatively expensive. The most common method of crowning a tooth involves using a dental impression of a prepared tooth by a dentist to fabricate the crown outside of the mouth. The crown can then be inserted at a subsequent dental appointment. 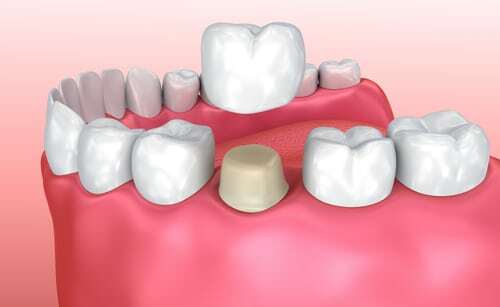 Using this indirect method of tooth restoration allows use of strong restorative materials requiring time-consuming fabrication methods requiring intense heat, such as casting metal or firing porcelain which would not be possible to complete inside the mouth. Because of the expansion properties, the relatively similar material costs, and the cosmetic benefit, many patients choose to have their crown fabricated with gold. https://ccfdentistry.com/wp-content/uploads/2017/01/dental-crown.jpg 307 500 bayouweb https://ccfdentistry.com/wp-content/uploads/2018/07/CamelliaCityFamilyDentistry.png bayouweb2017-01-24 18:48:062017-04-20 09:31:03What are Dental Crowns and How Do They Work?